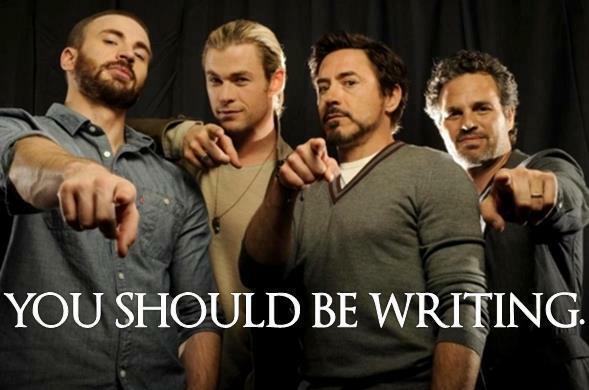 National Novel Writing Month (NaNoWriMo) is nearly over. 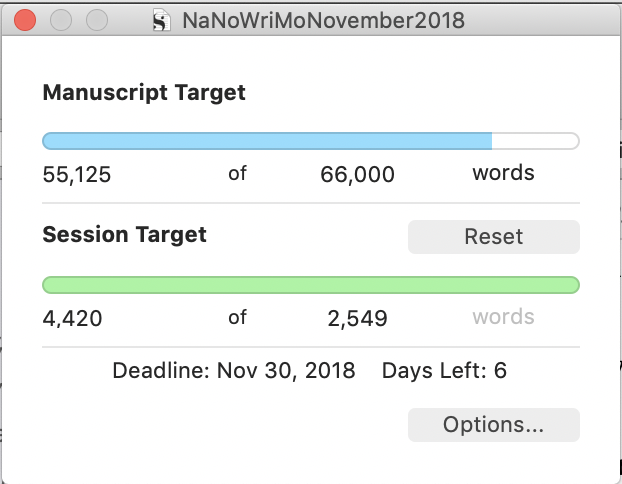 I hit the NaNo standard goal of 50,000 word over the weekend, though I still have a ways to go before I hit my personal goal of 66,000 (attempting to break my previous record of 65,591). This year’s project has involved writing some scenes multiple times from several perspectives—the most egregious one having now seven different versions, which is fairly amazing since it really consists of just two characters. Another scene that was written five times at least involves four active characters and one passive observer, which makes the multiple versions make a bit more sense. There are some who would say this isn’t in the spirit of NaNoWriMo, and certainly not in line with advice I have often given people who are stuck: to just write the next word and keep moving. Since each time I have redone a scene I started from scratch, I think this counts as legitimate first draft activity. I’m not revising, see. And if someone thinks this is a form of cheating, well for years I was a member of the NaNoWriMo Rebels. The original rules specified that you not write a single word of the story before the stroke of midnight on October 31. So I was a rebel because I was usually trying to finish one of more works already in progress. So if my multiple tellings of the same (or substantially similar) scenes is cheating, I guess I’m a rebel again. My progress as of last night. On the other hand, there is a scene that is told twice which I intend to go into the book that way. The reader will first seen the end of a battle from the point of view of the main villain of the story, as he arrives when most of the fight is over and tries to figure out what’s happening. Then in the next chapter the reader will see the beginning of the battle from the point of view of one of the protagonists and learn quite a bit more. And I think it works quite well. We’ll see what the readers think. I’ve been doing pretty well on this year’s NaNoWriMo. I’m well ahead of the pace needed to hit 50,000 words by the end of the month. But part of that is because this year my goal is to beat my previous record, which was a bit over 65,000 words, so I set the progress counter in my Scrivener project to that goal. Not everything I’ve written has been great. I do break one of the unspoken rules: I don’t revise scenes (well, other than when I notice a typo or something… sometimes I got back to a scene and add a sentence that I realize is needed to set up something later that I just wrote), but sometimes in the past when I have been really unhappy with a scene, I try writing the scene again, usually from a different character’s viewpoint. There is a particularly pivotal scene that I have been having trouble with, and so far I have written it from three different viewpoints. In each one, I’ve also started the scene from a slightly different place. Between the second and third attempt at the scene, I flashed back, as it were, and wrote some possible set up scenes from various viewpoints of various characters getting ready for the event in question to try to figure out what wasn’t working in the scene itself. Now, there was already part of my plan to write some different events in the book from multiple viewpoints. I show the villain coming into a situation that is already in motion and trying to deal with it. Then later I show the beginning of the sequence from the viewpoint of one of the protagonists, explaining some things that seem mysterious. There is similar thing where one of the protagonists comes in after some awful things have happened and is trying to pick up the pieces, then later I show what the villain actually did that led to the situation as this protagonist found it. That’s a specific dramatic ploy that isn’t the same thing as revisiting a scene multiple times from different viewpoints. Anyway, it’s all valid first draft stuff. We always know that some of what we write is going to get cut later. Completely unrelated to all of that, I wanted to note that last week we passed the 21st anniversary of my first husband’s death. This was one of the milder years, for me. Most years beginning a bit before my birthday (because I can’t think of my birthday without thinking of his, as our birthdays were only two days apart) through October and up until about the anniversary I tend to be more moody than usual and more susceptible to bouts of sadness and such. Three years ago it was a whole lot worse than average, last year it was a bit less bad than usual. I can never predict how it will go. I really can’t say that it has steadily gotten better over the years. There have been years more than a decade ago where it was about as mild as this year. And then there are the really bad years. I still think that part of why last year was better than usual was living in the new place. Every anniversary of Ray’s death before that, I was still living in the home we had shared when he died. So every day when I stepped out the front door I saw the climbing rose Ray had planted, for instance. There are still plenty of events and moments, and yes some things around the house, that remind me of him, but there are some things that used to recollect him that just are no longer here. Thinking about this made me realize something that I haven’t been making a note of, however. This week will be the twentieth anniversary of the first Thanksgiving that Michael and I celebrated together. I started to type that the coming Christmas will be the 21st, but that one is tricky. Michael was our friend before Ray died. And Michael dropped in several time in that December to check on me. So while the actual Christmas day I spent down in Oregon with my mom and relatives there, just before I went, Michael and I had a gift exchange. And though we weren’t yet officially dating at that point, at least one of my friends later told me that thought they had noticed we were already falling for each other. I think I’m going to be a bit pedantic and say, since the first time we hung stocking together on Christmas Eve, slept under the same roof, and woke up together to find out what Santa had left in those stockings on Christmas morning was 20 years ago, that this year will be the twentieth anniversary. Of course, a few weeks after Thanksgiving and more than a couple before Christmas, it will be our sixth wedding anniversary. Can’t forget that! While I’m working on National Novel Writing Month (NaNoWriMo) I’m going to try to get at least a few blog posts about writing. 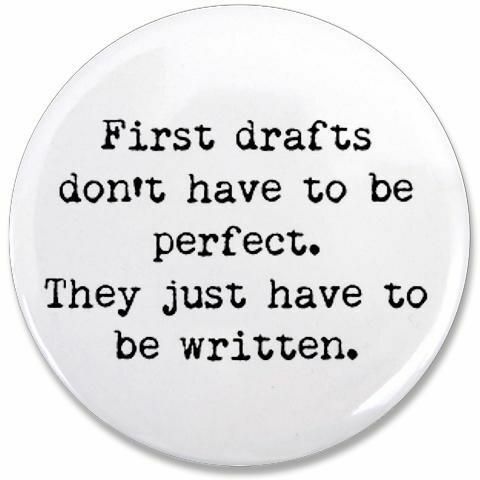 And during NaNoWriMo a particularly apt topic is that of first drafts, why a bad but finished first draft is better than a blank page, and so forth. There is one particular aspect of this topic that I probably haven’t written about enough. To get to that aspect requires me to lay a bit of ground work, so grab your favorite beverage, tuck in, and let me share some background. I first encountered Neil Gaiman’s writing back in the late 80s and early 90s while he was writing The Sandman for DC Comics. Sandman was not a superhero comic, it was the story of the incarnation/personification of Dreams, and over the course of the series Gaiman told tales crossing many genres: myth, mystery, horror, and a lot of things that are difficult to classify. It won a bunch of awards. One issue won a World Fantasy Award for short story–a thing which shocked some people so much they changed the rules so that no graphic novel or graphic story could ever be nominated in a World Fantasy Award writing category again. Anyway, over the years after I would encounter some of Gaiman’s short stories and novels. Some I liked, some I didn’t. But the ones I liked were always so good that I would always at least give a new story a try. When I first saw reviews of his 2001 novel, American Gods it sounded like something that would be right up my alley. A combination of fantasy and Americana that looks at the question, if ancient mythological creatures were all real, where are they now and what are they doing? Admittedly themes Gaiman had already explored in Sandman, but it’s an area of fantasy of which am an enamored. So I expected to love the novel. It would not be fair to say I hated the novel simply because I have never been able to make myself finish it. I got bogged down maybe a quarter of the way through. Since I’m often reading multiple books at any given time, I set it aside with a bookmark in place and grabbed another book on one of my shelves with a bookmark and read it. Months later I happened across American Gods on one of my shelves, and I picked it up read some more. And I still wasn’t feeling it. A few years later I headed into the computer room at our old house intending to copy some files from my desktop computer to take back to my laptop and my comfy chair in the living room and get some writing done. We used to have a small stereo in the computer room that one or the other of us could plug our iPods into. When my husband was playing video games on his computer, he often listened to audiobooks on the stereo. He was in the middle of one such book when I entered the computer room that day. And during the few minutes it took me to find the files I needed and copy them, I found myself sucked into the book he was listening to. I sat there for more than a half hour listening. I only stopped because my husband paused his game for a bathroom break, and also paused the book. I asked him if, as I suspected, the book he had been listening to was Anansi Boys. 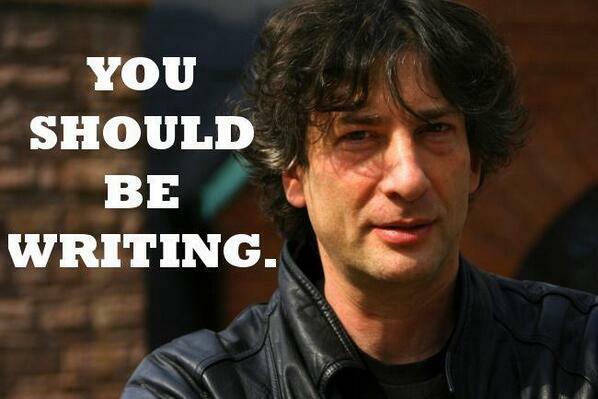 It is sort of a sequel to American Gods, though Gaiman said he thought of the second book first. Anyway, it shares one important character, and essentially happens in the same world. I asked my husband if we had a hardcopy of the book. He said he thought his copy was on the shelf next to his side of the bed. So I went, found the book, and spent the rest of the night reading Anansi Boys from the beginning, instead of writing. I quite enjoyed the book. So not long after, I figured that maybe, now that I had finished the sort-of-sequel and really liked it, I should give American Gods another chance. After all, I had disliked and not finished the first three or four Discworld books people had tried to get me to read years before. Then a friend convinced me to read Wyrd Sisters and, well, it wasn’t long before I owned a copy of every single Discworld book there was. I still found it impossible to become interested in American Gods or its main characters. There are many people whose opinions I respect who really like American Gods. There are many people whose opinions I respect who don’t like it—I can think of at least one friend who hates it with a passion. I don’t hate it, I just can’t get into it. On the other hand, there is the related book I love, and a number of other things by the same author I love. The lesson to be learned here is: not every story is for every reader. If someone reads your story and doesn’t seem to be interested—even if they come out and say they hate it—that doesn’t mean it’s a bad story. It doesn’t mean you are a bad writer. All we can know from that data point is that that particular story is not for that person. So don’t let the fact that anyone has ever reacted poorly to something you wrote stop you from writing something else. Don’t listen to that voice that says that no one will be interested in this story. Or that says you shouldn’t try. And so on. There is someone out there who needs the story you are trying to tell. I am confident of that. But they will never know they need it until they find it. And they will never find it if you don’t write it. So, go! Write! Tell that story! Now! 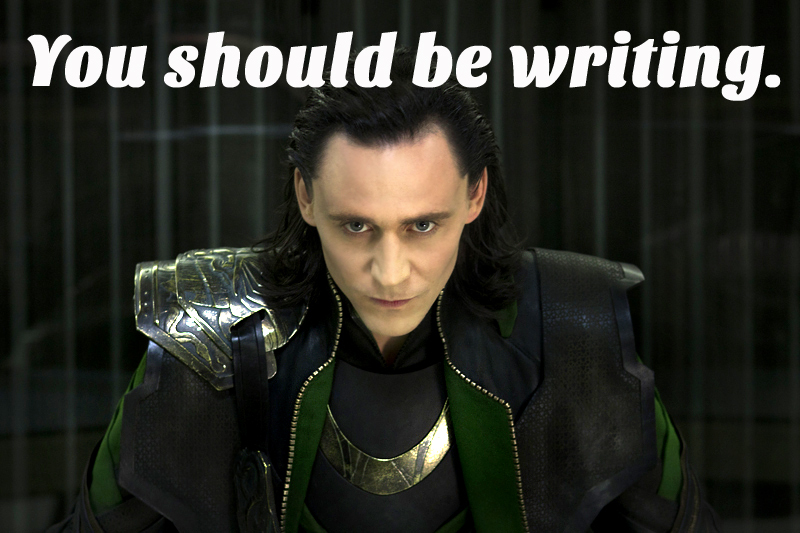 As mentioned previously, I’m doing NaNoWriMo again, and so have less time for blogging than usual. I was bantering with a couple of friends last night on line while also trying to finish a scene, and something one friend said about her childhood made me think of an interesting detail to add to the history of one of the characters I was writing. The other friend asked why would I complicate the story with that new detail, and I had to explain that just because I add some more information to a character’s biography doesn’t mean it’s going to pop up in the story. This reminded me of another conversation I was part of online elsewhere in which another NaNoWriMo participant commented that they had gotten bogged down because they reached a part of the tale where some characters needed to explain something that had happened off screen to other characters. Since NaNoWriMo is a first draft, experienced writers go into it knowing that a bunch of what we write isn’t going to remain in the final story. Sometimes we know that we’re just writing a scene to figure something out. Other times we don’t realize that all or most of a scene isn’t needed until much later, while we’re editing revising. It’s a whole lot of backstory, packed into a couple of sentences that set up a number of more mysteries and reveals that come up over the rest of the season. And having Stiles be the one who says it helps you learn a bit more about his personality traits that become important later: he notices things, he obsessively researches things, and no matter how many times his father, the Sheriff, tells him not to snoop, his curiosity just can’t be restrained. In order to write a character’s dialog correctly, I have to have a good image in my head of who he or she is. That doesn’t mean I need to know eye color and hair length and how they dress, necessarily—I’m using image metaphorically. I mean that part of the process of giving a character a personality is imagining their life and how they got to be who they are now. 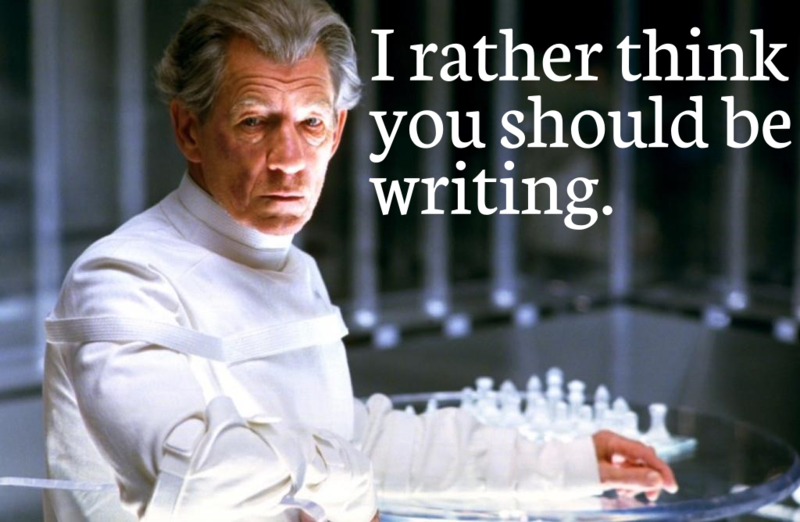 This is for everyone, even walk-on characters who may have only one or two lines of dialog out of an entire novel. I’m not one of those authors who has to write all of that down before I can use the character. Walk-ons usually just pop up when I need them. I’ve put my protagonist in jail, let’s say, and I’d planned who his cellmate would be before I got to the scene, but I hadn’t thought much about any other prisoners. As I start writing the scene between the protagonist and his cellmate, the other prisoners just chimed in at appropriate parts. While I don’t know the names of any of them, I have a small sketch in my mind of each one’s personality and a bit of his or her history, too. It just blossomed as soon as I needed someone to make a humorous interjection. That’s just the walk-ons. Supporting characters that are planned as parts of subplots have quite a bit more than that, while the main characters have even more. Even without any description or names, reading that dialog tells you that these two have known each other a long time, that they used to be close (perhaps even romanticaly involved), and now they are less friendly. I may never reveal more about the past experiences between these two characters, but I know how they met, how long they were close, how they spent their time together, and how they had their falling out. Usually I’m pretty good about not letting the backstory over shadow the current action. But not always. Especially if I get some characters together in a scene who are very talkative. The dialog can go on and on for a while, if I let them. During re-write I always find some scenes like this, filled with a lot of interesting banter, but that I need to trim. When reading the scenes aloud, even just by myself, I can tell when they’re going on too long. Fortunately, usually it only takes a little pruning to punch up the scene and get things moving. But sometimes that backstory includes information the reader needs, and it isn’t always clear until I get a reader’s perspective that some details I thought could be inferred weren’t obivous. I have a couple of supporting characters I’m working with right now whose scenes I was trimming the last couple of nights. They’re both intresting characters. I’ve gotten feedback indicating readers like them. (Even though in the current novel they don’t have any scenes together, one of them had a short story of his own published a few years ago, and the other happened to be a supporting chracter in it.) But they’re only supporting characters in this tale, and the parts they have to play in the current story aren’t big enough to justify all that information. Even though I saved the removed dialog elsewhere, it still hurts to trim it. But when it’s too much, it has to go! 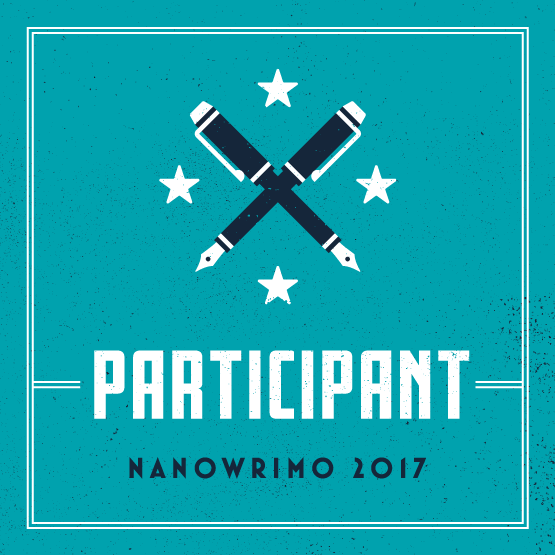 You should be writing — whether you join us in NaNoWriMo or not! 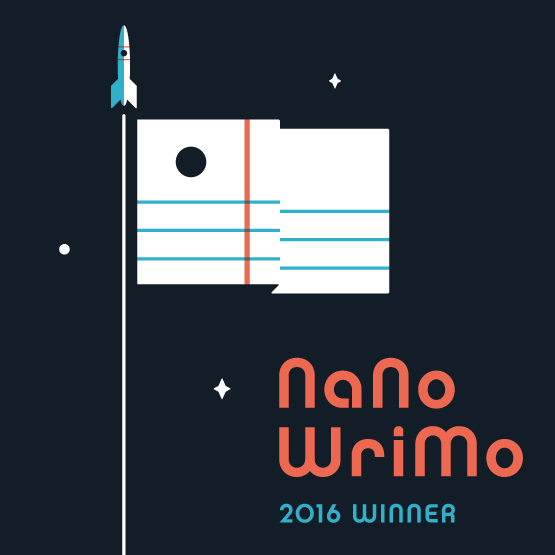 It’s the first of November, which means that it’s National Novel Writing Month (NaNoWriMo)! NaNoWriMo is a lot of fun. I frequently recommend it precisely because the point is to just keep writing and not worry about being perfect. That worry often paralyzes people, preventing them from writing. Oh, they type out a few words, maybe a few sentences, but then they stare and delete and write something else. It is easy to fall into the trap of rewriting and revising a story (or a single scene) again and again because it isn’t perfect. At which point I usually launch into my rant about how writing is not the inverse of literary criticism? What do I mean by inverse? Well, let’s first consult the Oxford Dictionary of the English Language. The relevant definition is: “ Of two operations, relations, etc. : such that the starting point or antecedent of the one is the result or conclusion of the other, and vice versa; (of one such operation, relation, etc.) opposite in nature or effect (to the other).” So, for instance, untying a shoelace is the inverse of tying it, while tying the shoelace is likewise the inverse of untying, right? So, what do I mean when I say that literary criticism isn’t the inverse of writing? I mean that if one imagined the process of analyzing and deconstructing a story as a series of tasks, performing those tasks in reverse doesn’t produce a story. And when you compare your ability to find flaws in a story as being a necessary skill to creating a story, you are misunderstanding the creative process. Also, knowing how to perform literary deconstruction doesn’t guarantee that one understands stories—it means one understands paradigms that some authorities have proclaimed about stories. Another way to understand it is to think about music: literary criticism and the like can be looked at as similar to understanding the mathematical equations that describe sound waves. Understanding those equations doesn’t mean you can think up a catchy tune. Which doesn’t mean that studying music theory might not improve your music making, but it doesn’t guarantee you will make compelling, or even mildly interesting music. So, for instance, when a story teller begins working on a story, they don’t make lists of the metaphors they intend to use. Likewise, we don’t usually think about what the theme of the tale is and so on. I, personally, virtually never know what any of my metaphors are in a story unless someone points them out to me. Everyone’s process is different. Most of my stories begin as a question, and the process of writing is how I try to find the answer to that question, and to the subsequent questions I uncover while working on the first. Analysis is very useful during the editing and revising. Studying some of the things we can quantify about how stories work isn’t a waste of time. But don’t focus on that. Certainly not when you’re at the first draft stage. Once again, time to start your word processing engines! There are rules, but for years I participated as a Rebel, until a few years ago when they dropped the one rule that kept making me a rebel. Write one 50,000-word (or longer!) novel, between November 1 and November 30. Write a novel. We define a novel as a lengthy work of fiction. Be the sole author of your novel. Write more than one word repeated 50,000 times. That second bullet is the rule that they changed. Most years I use NaNoWriMo as a motivation to work on some stalled or otherwise unfinished projects rather than starting from scratch, which is why I was always over in the Rebel category. NaNoWriMo is a lot of fun, and I find that having a few friends participating and mutually cheering each other on (and in a couple of cases to try to race against, word-count wise) helps me get a lot of work done. NaNoWriMo isn’t for everyone. But I’ve seen people who didn’t think they’d like it come out happy that they’d given it a go. If you’ve ever wanted to write and have trouble finishing, give it a try. Particularly if the thing that is holding you back is a feeling that whatever you’re writing isn’t good enough, there is something freeing about just focusing on getting the word count up. Leave editing for later. you can revise and correct a horrible draft, but you can’t do that to a blank page. And it is supposed to be fun, not a chore. I think I know what I’m going to work on this year. But I’m leaving myself the option to change my mind at the last minute. 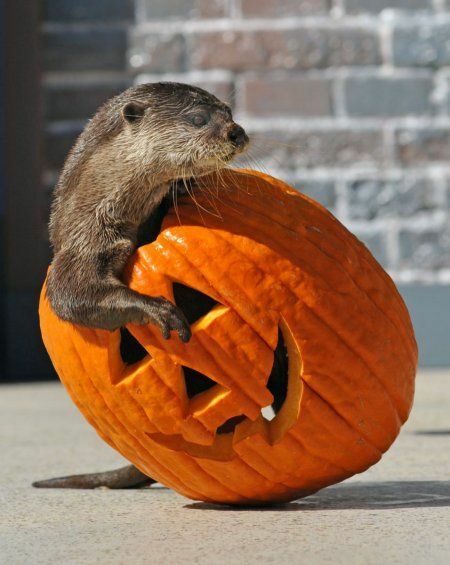 Someone’s getting ready for Halloween! Last Sunday I needed to run to the grocery store for a couple of things before my football game, which was earlier this week than it usually is. I started the car, flipping on the wipers to clear the heavy layer of dew off the windshield, and lowered and raised the side windows for the same thing. I started to put the car in gear when I realized that my music wasn’t playing. I looked at the stereo in the dash and the main screen said “No Device.” We have a small collection of old iPods loaded with various subsets of my music library that I rotate through the car. So there’s always an iPod plugged into the stereo, and the stereo is set to automatically start playing music from the iPod on shuffle when it starts up. There was no sign that the car had been broken into (one of the reason we have several iPods salvaged from the junk pile at my husband’s workplace is that we have had about four previous iPods stolen from over the last ten years and two cars), so I knew the most likely cause was that the iPod was too cold. I opened up the console, dug the iPod out while trying not to disconnect its cable and it was definitely ice cold. Electronic devices with internal rechargeable batteries have temperature sensors that deactivate the system if the device is either too cold and too hot, because the chemical processes inside the rechargeable batteries don’t operate as efficiently (and safely) outside certain ranges. This made me realize that the overnight low temps are cold enough that I probably should sit in the car letting the engine idle for a couple of minutes before driving. And this is yet another sign of the changing of the seasons: sometimes it’s cold enough to disable the iPod. That probably means I should bring swap out the iPod in the car to change out the music a bit. And that reminded me that while I have been thinking about a new Halloween playlist, all I have actually been doing is listening to all my old ones (I usually make a new one each year). Combine that with a conversation between two friends on social media about playlists for NaNoWriMo, and I spent more than a bit of my free time this week setting up a new Halloween playlist and a possible NaNoWriMo playlist. I love making playlists. Given that there are literally thousands in my library, I probably love it just a bit much. Writing playlist are assembled in several different ways. Some songs I associate with certain characters. Lots of songs simply evoke moods. A good friend always remarks on how many of the songs in my writing playlists have lyrics. He says he can’t write while listening to people talking or singing words. I get that, and I have a few writing lists that are entirely instrumental. The key, of me, is that the songs that have lyrics can only go into a writing list if I know the song well enough that I don’t have to actively process the words to follow the song. Many of my writing playlists are intended to help me think about writing while doing other things. Listening to my playlist, “A Dark Lord’s Lady” during my evening walk, or while riding the bus, or walking from the bus to the office, or while working on certain tasks at work make keeps me in the mood to write scenes related to one certain characters and subplots in a couple of the books in my fantasy series, for example. Whereas the playlist, “Devil in the Trickster Details” has me thinking about a completely different set of characters and their subplots across….. many more of the books in the series. To make a new list for this year’s NaNoWriMo requires me to decide which of many projects to actually work on this November. And that’s a problem, because I’ve been running the Red Queen’s Race in regards to a bunch of writing projects for the last few years, and can’t quite manage to actually finish anything. Which is frustrating, but also entirely my fault. Compounding the problem for many of us it the grinding compassion fatigue/outrage fatigue/existential fear fatigue that world events have been inflicting on so many of us. There were literal mobs roving streets of cities this weekend looking for liberals and queers and anyone else the alt-right thinks of as enemies. They beat a bunch of people up, and in at least three cases the cops arrested the victims. It should be no surprise, then, that many of us are having trouble getting into the mood for holidays, no matter how much we may love Halloween. Let alone getting in the mood to write a novel. But I refuse to give up. In this kind of social/political atmosphere, creating is an act of rebellion. Having fun that doesn’t come at someone else’s expense is an act of rebellion. I’m trying to remember that. Let’s all try to accomplish some creativity and celebration together, shall we? I was really bad this year and didn’t even start the new Scrivener project file for NaNoWriMo until nearly 11:30. Yes, once again I am participating in National Novel Writing Month. If you aren’t familiar, I’ve written about it a few times, most recently here. If past NaNo’s are any indication, I will be blogging a bit less all month because of all the writing on the novel. If you’ve never done it, there is still time to jump in and give it a try. And if you’re already doing it, feel free to add me as a writing buddy. Gentlefolk, start your (word processing) engines! Do you like stories? Have you ever thought about telling stories? Do already know that you like telling stories? Do words make you happy? Do you have a favorite word processor, or a favorite pen, or a favorite writing notebook or the like? Do you like a challenge? Have you ever wondered what it’s like to work on a creative project at the same time a bunch of other people are working on something similar? If any of the above applies to you, then you might want to give NaNoWriMo a try. Usually about this point in this post I would veer into some advice about the virtues of getting a draft down and not worrying about quality. And probably will write something about that in the next few days, but a friend shared an interesting post that goes in a slightly different direction that I think many people might find valuable. I should note a couple of things. The Story Nurse gives out customized writing advice, and this particular letter writer talks about struggling with thoughts of suicide and other types of anxiety, and how trying to force themselves to power through stalled writing projects makes that worse. So, consider yourself warned. Set the goal of creating works that are explicitly for practice, rather than going directly to big projects that you care passionately about. The less emotionally attached you are to the work you’re doing, the less energy you’re feeding into that self-doubt dynamic. She also suggests keeping a compliment file. That’s a place where you save kind things people say about your work or just about you. Anyway, take a look at that column. I think several of her suggestions for this letter writer are good things to try. And check out the Story Hospital website for earlier columns. And if you’re planning to participate in NaNoWriMo, and would like a writing buddy, you can add me: FontFolly. Let’s tell some stories! My NaNoWriMo project this year was to fix the gaping plotholes in two novels that I had decided to split apart from a previous NaNoWriMo. I had decided that there were just way too many subplots for one novel, and the fact that for at least three-fourths of the original 105,000 word draft that there were a bunch of the characters who never interacted with the others until the end, led me to try separating it. But it wasn’t a matter of arbitrarily breaking it in the middle and trying to write something that would feel like climax but still lead into book two. The first two-thirds of book two happens at the same time as the entirety of book one, and then all the characters from book one start coming into the main plot of book two. Also one of the sets of subplots came together in a big battle (it’s a light fantasy in an epic fantasy wrapper, so there are battles) in the second half of the original rough draft made the book feel as if it had two climaxes, so trying to turn it into two books made sense. Anyway, I had second drafts of two related books that didn’t work and had a some missing connective bits, so I made that this year’s project. Existing scenes that required a major re-write were counted in this year’s word count along with completely new scenes. And I hit the 50,000 mark, and have at least improved things, but I don’t feel as if I’ve actually fixed the plot problems. Which was what I had hoped for. I don’t really have a conclusion. I know my productivity went way down after the election, and I haven’t really gotten back into a good space where I’m being productive and liking what I write.